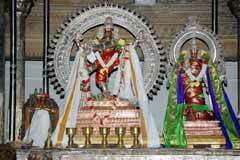 Margazhi Tiruvadhirai is the important festival of the temple in December-January. Panguni Brahmmotsavam and float festival in March-April and Aani sapling planting utsav in June-July are other festivals. 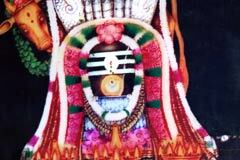 The foot print scar of Kamadenu the divine cow is visible on the head of Shivalinga in the temple. There is a tamarind tree in front of the temple known as Piravapuli meaning that its seeds will not germinate wherever sown. There will be no worms in the cow dung in the surrounding area. 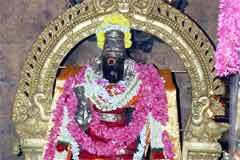 The temple is opened from 6.00 a.m. to 1.00 a.m. and 4.00 p.m. to 8.30 p.m.
Sri Patteeswarar Temple, Perur, Coimbatore. Phone: +91-422-260 7991. Lord Nataraja generally appears in all temples in an active dance posture. The difference in this temple is that He appears with legs downwards showing the end of the performance. He looks slightly mischievous. With bright cheeks and the hair falling behind, the appearance is quite pleasing to the eyes of the devotee. It is here in the Kanaka Sabha Lord granted His Ananda Thandavam darshan to Lords Brahmma and Vishnu, Mother Kali, Saint Sundarar. People pray to Lord for name and fame and for success in their endeavours. Realizing their wishes, devotees perform abishek and archana to Lord Shiva with Vilwa leaves. 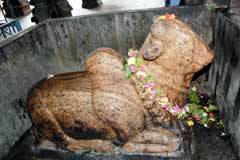 The foot print scar of divine cow Kamadenu is still visible on the head of Lord Patteeswarar. The heads of the eight directions are figuring in the vimana of the sanctum sanctorum. The vimana of Mother Pachai Nayaki is square in shape. 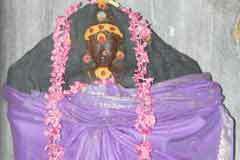 There is a shrine for other Ambica Mother Manonmani. 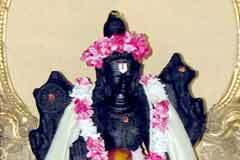 Lord Muruga is in between the shrines of Lord and Mother in the Somaskanda form. As this is a salvation centre, Lord Bhairava appears without His dog vahan as Gnana Bhairava. 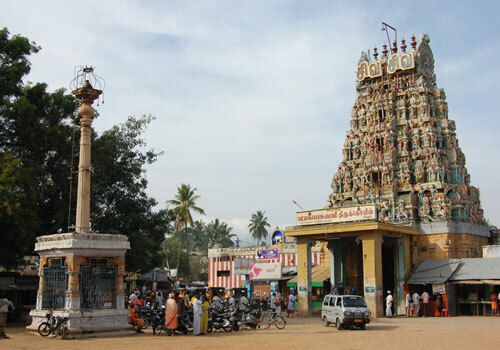 The shrine of Lord Varadaraja Perumal is outside the shrine of Mother Pachainayaki. 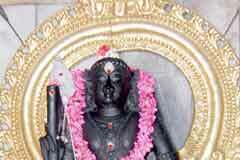 Sri Anjaneya in the temple is made of wood. As Lord played here as one from a lower community, the sapling planting festival is devotionally celebrated in the temple. There is a tamarind tree in front of the temple the seeds of which do not germinate if sown, indicating the truth that those pray to Lord Patteeswara will attain total salvation and will br freed from the cycle of births and deaths. The Palm Tree is praised as Irava Panai meaning that it would never fall down meaning that those devoted to Lord Patteeswara would ever be standing straight with name and fame. 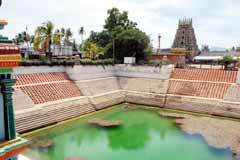 The bones of those dead, when placed in the Noyyal river flowing near by the temple turn white stones, it is said. It is believed that Lord utters the five lettered Na Ma Shi Va Ya mantra on the ears of those dead and takes them with Him. It is a wonder that no germs could be found in cow dung around this place. Divine cow Kamadenu performed severe penance on Lord Shiva seeking the post of Lord Brahmma to take up the Creation work. It was pouring its milk on the Shivalinga here hidden in an anthill. Its calf Patti in a playful mood, hit the anthill and demolished it. Shocked Kamadenu fell at the feet of Lord and sought His pardon. Appearing before the divine cow, Lord said that He was only pleased with the calf. Lord further said that the place was the first among the salvation sthalas to His devotees and that He would grant the creation boon to Kamadenu at Tirukaruhavur and advised it to perform penance there. Lord mercifully said that this place (Perur) would be praised as Kamadenupuram and Pattipuri after name of the calf and that He would stay in the place as Patteeswarar. Miracle Based: The footprint scar of Kamadenu is still visible on the Lord in the temple. The seeds of the tamarind tree if sown do not germinate. 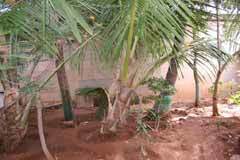 No germs could be found in the cow dung in places surrounding Perur. Perur is 6 km from Coimbatore on the road leading to Siruvani. Town bus facilities are conveniently available from almost all corners of Coimbatore.